Summer. (sigh) The weeks are flying by. I try to linger in the moments to make it last. The hard moments, the days that last forever- I remind myself in those moments- yes, even this is a gift. Summer me is so much more relaxed and calm and fun than back to school me. I have so much more energy to pour into random every day details. We pool. We see friends. We not cook. It's good stuff. Recently I was lamenting to my friend Wendy. Quotes I made about the importance of Inclusion were published in an article in our local paper. I was telling Wendy- I'm still scared after I speak out. This lingering fear haunts me for a few days. I don't want the wrong people to feel guilty. I don't want it to affect how my boys are treated. All I want to do it tell the truth, and fight for what is right. At the end of my life, I want to know I fought hard for the things that mattered. I want to know I loved hard the people who mattered. I want to know I looked fear in the face and did it anyway. Wendy reminded me- This is your work. Just keep doing your work. Everyone else is responsible for their own work. They have to rest their head on their pillows and know they did a good job. My talk with Wendy was an important reminder that Advocacy is my work. (Other peoples feelings are not my work.) Advocacy is a job I never interviewed for, and the only training is messy and on the job as you go along. And the school year is my busy season. I thought now might be a good time to talk to you about the foundation of Special Education. Understanding rights will help you advocate on the grass roots level for your child or student. In the current culture and climate- person by person, school by school, district by district is the only way we can create any kind of change. I am a champion of Teachers. Teachers, I see you. I see your lack of resources. I see your inability to constructively criticize the system to your administration because it will cause apathy at best, and retaliation for being the squeaky wheel at worst. Teaching is not administration. There are amazing teachers doing their work. Keep doing your work- which means showing up every day and giving your best to those students in your care. Your work is THE MOST important part of it all. Sometimes the man behind the curtain forgets that. Sometimes I have to advocate for resources for your classroom to ensure my boys get what they need. Needs and resources don't always line up, and you are sometimes expected to theoretically feed 100 people with 10 meals. Advocating for resources is my work and I am happy to do it. 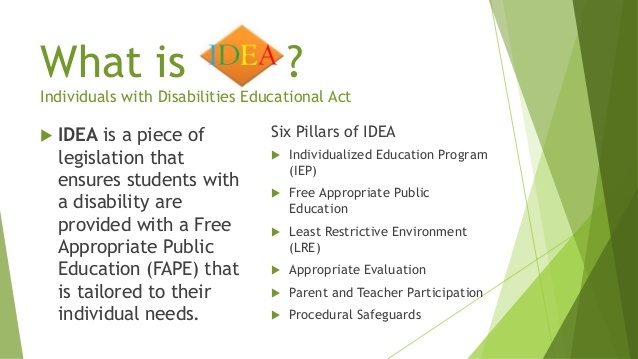 The Individuals with Disabilities Education Act (IDEA) is a law that makes available a free appropriate public education to eligible children with disabilities throughout the nation and ensures special education and related services to those children. Originally adopted in 1975 and amended in 2004, the IDEA aims to curb educational problems associated with low expectations and insufficient focus on alternative research, teaching methods, and tools. 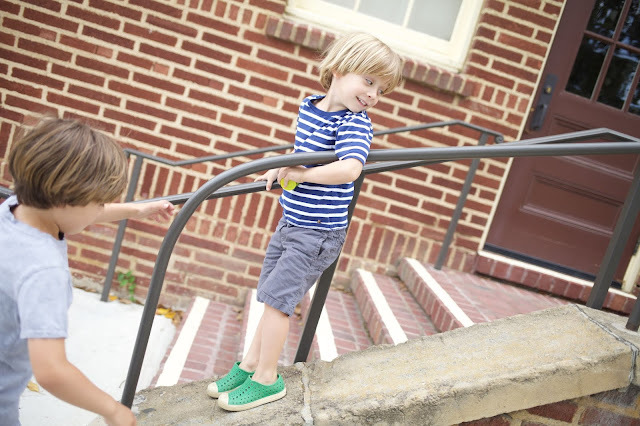 IDEA governs how states and public agencies provide early intervention, special education, and related services to more than 6.5 million eligible infants, toddlers, children, and youth with disabilities. Infants and toddlers, birth through age two, with disabilities and their families receive early intervention services under IDEA Part C. Children and youth ages three through 21 receive special education and related services under IDEA Part B. If you want to read the IDEA entirely, click HERE. I'll summarize some important things to know, including the six pillars of IDEA. These descriptions were written by Matthew Saleh, a Research Fellow at Cornell University’s Employment and Disability Institute and a Research Associate at the Campaign for Educational Equity at Teachers College, Columbia University. He received his J.D. from the Syracuse University College of Law and is currently a doctoral candidate at Columbia University. I added some additional comments in red! Under the IDEA, every child with a disability is entitled to a Free Appropriate Public Education (FAPE). The IDEA emphasizes special education and related services, which should be designed to meet a child’s “unique needs and prepare them for further education, employment, and independent living.” NOTE: the high standards! 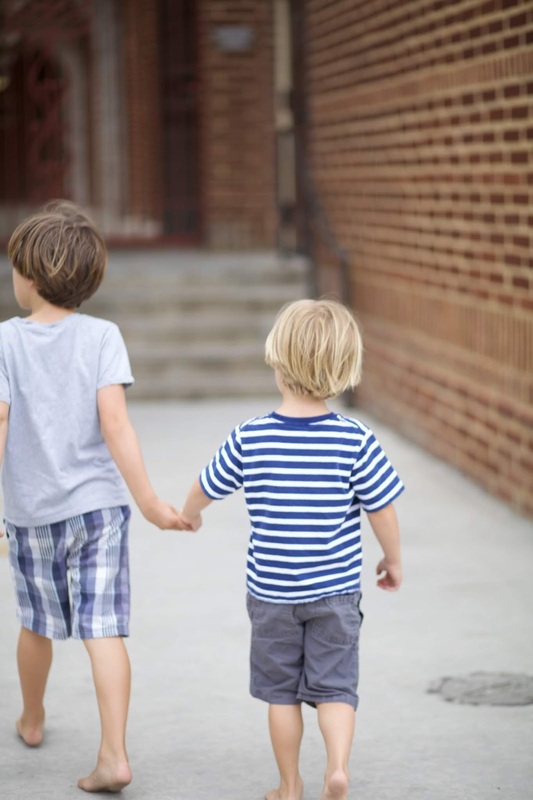 Furthermore, courts have held that the IDEA requires schools to prepare Individualized Education Plans, which confer “meaningful educational benefit” to children with disabilities. 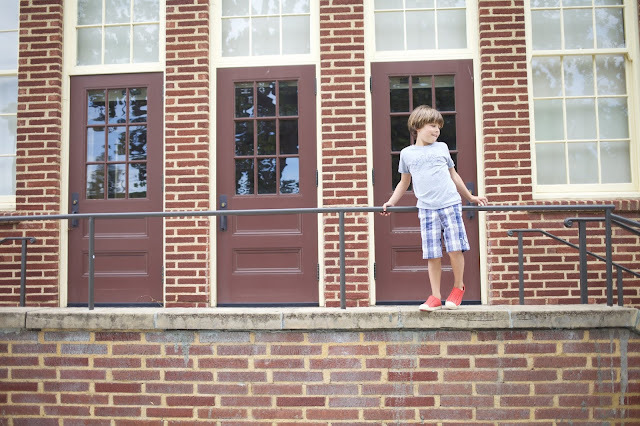 The “meaningful educational benefit” requirement includes a focus on raised student expectations, appropriate progress, and transition into postsecondary education and independent living. Meaningful educational benefit is HUGE. If your child isn't reaching goals year after year than it can be argued they are not making adequate progress. If you do not agree with an evaluation done by the District, In the US, by Federal Law, you can request that an outside provider of your choosing, do a new evaluation called an Independent Educational Evaluation- IEE- for your child, at the cost of the District. You must put it in writing, and the District has 30 days to respond to your request. They can either agree to it, or file for a Due Process Hearing to show why the IEE is not necessary. EVERYTHING needs to be on the IEP. 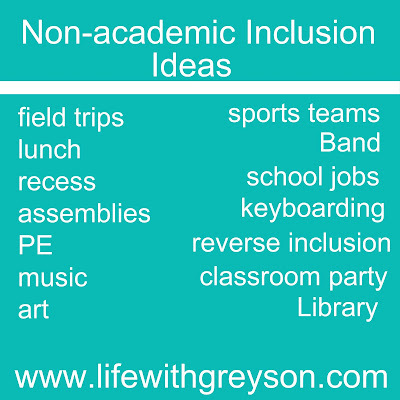 Spell out any requests for Inclusion on the IEP- be specific. If you want specific written information weekly/monthly etc. such as confirmation that Speech or OT occurred per the IEP, make the request at the IEP. In the case Endrew F. v. Douglas County School District, the U.S. Supreme Court ruled in favor of a higher standard of education for children with disabilities. Schools must provide a meaningful education in which children show significant progress and are given substantially equal opportunities as typical children. IEP goals must be appropriate, meaningful, and a child needs to make progress. If an IEP team determines that a student cannot be satisfactorily educated in a general education setting, then the team must make responsible efforts to determine the LRE for that student outside of the general classroom. Inclusion is NOT black and white. It can also happen beyond academic settings, such as library, lunch (not sitting on opposite sides of the table), field trips, art, PE, assemblies and more.) 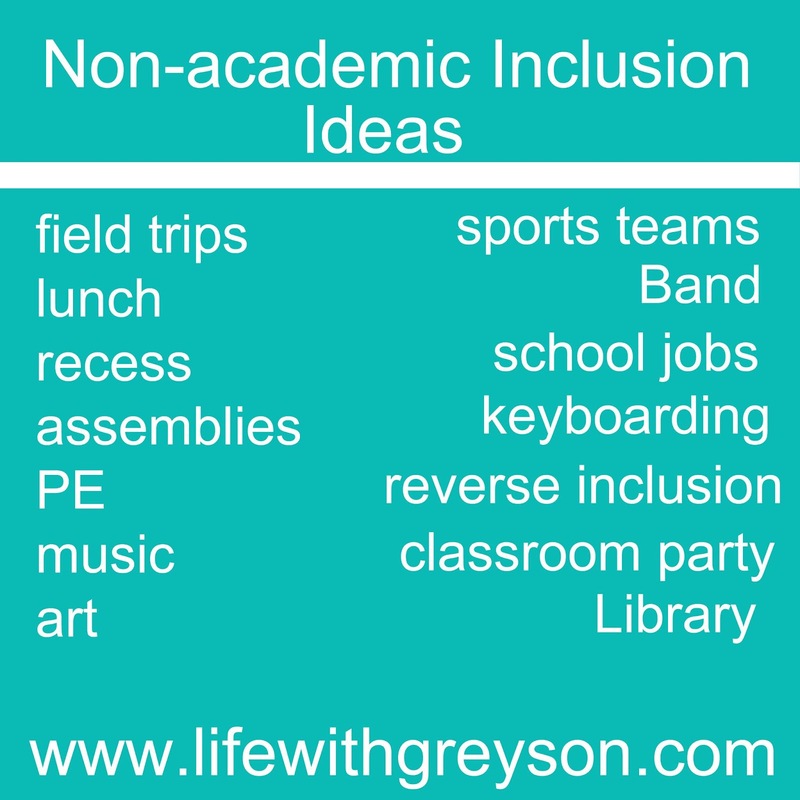 You can also make specific requests for Reverse Inclusion- where General Education Students come into Special Education Classrooms to work on goals or social skills. The IDEA has a special provision for “parent participation in placement decisions.” Under this provision, state educational agencies and local school boards must ensure that the parents of a child with a disability are members of any group that makes decisions regarding the placement and LRE of that child. You can also request parent education. Understanding IDEA, has been imperative in my advocacy work. I've met with Teachers who are not familiar with the specifics of the act. In touring schools for Parker, I asked one Teacher how placement in the Least Restrictive Environment, and Inclusion worked in her classroom. She told me that "If a student can keep up with the common core standards in a subject area and they aren't disruptive, then they can go into a General Education Classroom." This method doesn't jive with Federal mandate of educating students in the Least Restrictive Environment as mentioned above. We can not expect Teachers to know all the provisions of IDEA- but it's great when they do. It's up to us to do the research. It's also important to understand exactly what a Free and Appropriate Public Education (FAPE) means. First of all- there is NO one size fits all educational requirements for any child receiving Special Education. It's important to understand what your child needs- but also- know the types of things that will interfere with your child's ability to receive FAPE. Not receiving any of the pillars of IDEA can interfere with your child's ability to receive FAPE. Not receiving the appropriate Related Services can interfere with your child's ability to receive FAPE. The term related services means things needed to help a child access their education. Examples include: transportation, speech-language pathology and audiology services, interpreting services, psychological services, physical and occupational therapy, recreation, including therapeutic recreation, social work services, school nurse services, counseling services, including rehabilitation counseling, orientation and mobility services, and medical services. For example, if a child has a Speech Disorder, they will need help with Speech and Language in order to be able to learn- or to be able to access their education. One thing that has helped me embrace my role as an advocate, is that I believe this is exactly what I am supposed to be doing with my life. There are few things more important in a child's life than education. Their socioeconomic background, their home environment, their ethnicity, how and by whom they are being raised, the love they are given, their health, the grades they get, their athletic ability-- unfortunately none of these things are guaranteed or distributed evenly. An opportunity to learn is one of the few things guaranteed to all children, regardless of circumstance. And fighting for that is my work. It's one of the best and hardest jobs I've ever had.